Our wide spread infrastructure is fulfilled by all units varied from production to export. We provide complete solution of Indian ladies wear which are manufactured by our team of professional & expert designers and craftsmen. We perform uniform quality checking of our range of products before supplying these to our esteemed clients. With the aim to store all our products in a secure and streamlined manner, we have maintained a separate warehousing unit. 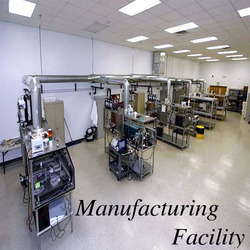 This unit is divided into varied sections and sub-sections to have categorized storage of all the product. Our warehousing unit is equipped with latest testing equipments used to examine the products before delivering them to the end users. Apart from this, the warehouse of our organization is properly connected with varied transportation modes due to which, we are able to provide on-time delivery of orders at the patrons' premises. Moreover, a team of storekeepers is hired by us to ensure proper maintenance of our warehouse and to also keep a tab on all the incoming and outgoing. We have also appointed a team of packaging personnel to pack our entire collection. These professionals use attractive and quality packaging material to ensure safety of our products during transits.